The cause and effect of our second conference has encouraged us to host the third bigger and wider pastor's conference for the district of Kanchipuram, solidifying the bonds that we have been building with pastors in Chennai and the surrounding areas. This conference will provide encouragement and unity amongst the local leaders, many of whom labor alone in their churches. 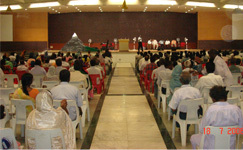 For more details of the previous conference. Over coming fear in the deepest level, with the inspration for it being drawn from 2 Timothy 1:7 "For God hath not give us a spirit of fear; but of power, and of love, and of a sound mind. Basically, it is a call to move forward in freedom to walk in fullness of life in christ, breaking barriers and being a radical follower of the Lord Jesus Christ.